There are fewer things more iconic in Southern California than a Sunday spent in Pasadena. 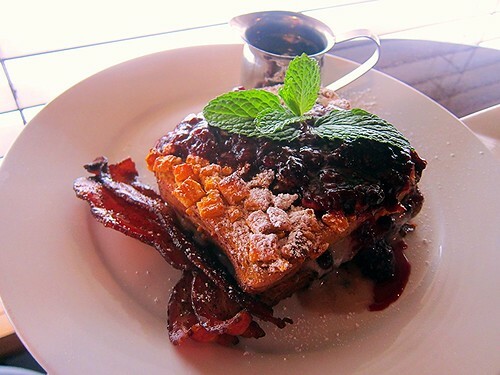 Whether you’re on your way to The Rose Bowl Flea Market the second Sunday of the month or are in the mood to lazily stroll Old Town Pasadena afterwards, the Red White + Bluezz Sunday Brunch is a southern treat that shouldn’t be missed. I recently had the pleasure of joining their staff in narrowing down eight Bloody Mary recipes to a favorite one that would be served on Sundays, so I personally had a hand in making sure those $25 carafes (serves 5) of spicy, tomato-vodka goodness are delicious. (You can also get a jug filled with Strawberry Jalapeno Margarita, Hurricane, or Rum Punch for the same price.) You can also opt for the $15 bottomless Champagne, Mimosas or a decent selection of craft beer to suffice as your liquid brunch. You’ll have the pleasure of live jazz to accompany your delicious Sunday. The food itself stands on its own. 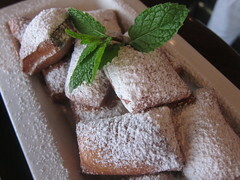 You’ll want to start with a plate of Beignets (they’re solid, as if from New Orleans). And the Fried Green Tomato Caprese, made with heirloom tomatoes, burrata, crispy prosciutto di parma, creole vinaigrette and basil oil is actually kind of delightful. 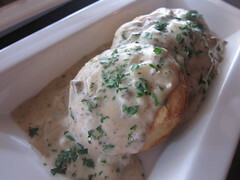 And of course, it wouldn’t be a Southern brunch without biscuits – whether paired with gravy or housemade jam. For true Southern specialities, there’s always the Shrimp & Grits, free-range Chicken & Waffles and the Crawfish Po’ Boy. If you’re jonesin’ for a steak, go for the Rib-Eye and Eggs. But no matter what, you won’t want to overlook the Banana Pudding as you close out with a cup of coffee (to which you can add your favorite liqueur) and dessert. The pudding is chock full of banana flavor and the perfect exit to the rest of your day. This entry was posted in Brunch, cocktails, Food, Music, Pasadena and tagged bacon, band, bloody mary, breakfast, brunch, carafes, jazz, live music, lunch, Old Town Pasadena, Pasadena, Red White + Bluezz, Sunday. Bookmark the permalink.